When King Louis XVI fired Necker the people of France started to get upset, thinking that the conservatives were trying to get in the way of the possible liberal changes. Crowds started to gather around Paris to protest these changes in a variety of ways. A newspaper writer named Camille Desmoulins tried to rally the crowd to start violent protests by claiming the King was going to use foreign troops to force the end of these protests. The crowd would become so frenzied that they stormed the Hôtel des Invalides (a military museum among other things) to obtain guns to fight the invasion by these foreign mercenaries while others started to steal food and supplies for the upcoming fight. The French Guards tried to rally their men to stop the riot but many of their troops joined the rioters instead. What remained of the French Guard would be forced to open fire on the crowd when they turned violent, but there were too few of them to make any difference. 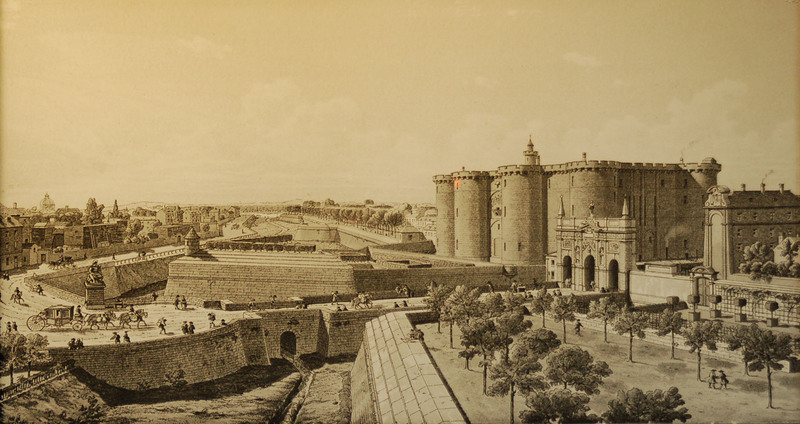 prison called the Bastille that was known to have 30,000 lbs of gunpowder. The Bastille had long been known as a symbol of oppression by the Kings so it was a perfect target for the attackers, even though there were only 7 prisoners there at the time. The leader of the Bastille (Governor de Launay) would try to cut the drawbridge and other things when he saw the crowd of over 1,000 people moving in to attack. The Bastille troops were determined to outlast the rioters until they saw French troops who had abandoned their post bring cannons in to try to enter the building. At the sight of the cannons Gov. de Launay realized that he didn’t have the troops to stop this invasion and chose to open the doors in the hopes that he could save some of his men by doing so. Once inside, the rioters would capture de Launay and try to kill his men, but the French guards in the crowd stopped the murder of all but 2 of the average troops in the building. De Launay was force to stand there while the men debated over the most painful way to execute him, so he chose to force their hands by kicking one in the groin and shouting “Enough! Let me die!” Once all the troops were killed the crowd would behead them and march around the streets of Paris parading the heads on the end of pikes for all the people to see. After the Bastille was taken, the crowd would begin to tear it down in a symbolic effort to show that the King’s power was, at least to a degree, coming to an end. Since they had no large scale tools to do this with, the crowd of thousands would simply rip the castle apart brick by brick with their hands. At the sight of this, large portions of the French military would abandon their post and join the riots and without the military the King is powerless to stop the protests, although he still didn’t understand the true significance of this moment. It became such an inspiring moment that Lafayette would get the main key of the Bastille and send it to George Washington as a peace offering for the harsh way he had spoken to him in their debates over slavery. The dismantling of this building would become the symbol of the Revolution for the French from that moment on, to the point that they celebrate this every year on July 14th as their independence day. Contrary to what some textbooks imply, the fear of the counterattack using foreign troops didn’t fade after the destruction of the Bastille, and the crowd would continue to prepare for the incoming attack. A mob would attack and kill Jacques de Flesselles (the mayor of Paris) and begin to build barricades in the streets for the coming battle. The crowd continued to be completely paranoid and tons of completely fabricated rumors would spread like wildfire, which caused civil unrest and the complete collapse of law and order. The King eventually realized that he was powerless against this and pulled his troops out of Paris, giving Lafayette power over a new military group called the National Guard in Paris. The people of Paris chose a new cockade to represent the Revolution, wanting to use symbolic colors of Paris (red and blue). Lafayette would temper their radicalism slightly by adding the color white, which was the color that represented the family of the King. The riots would soon spread the countryside with every bit of the violence that had been seen in Paris. Mobs would attack rich people and churches all over the country, with up to 40,000 people being killed in what has been called “the Great Fear.” The fear that drove this violence was that the nobles would unite and attempt to take the power back from the 3rd Estate, but the nobles would instead flee the country. These Émigrés (like immigrants) would spend the next few years trying to urge foreign monarchs to invade France and help the French Monarchy. Instead of helping these monarchs would allow the chaos in France to continue, wanting the French to be less powerful so that they could gain in power. The idea that France might later unify to become more powerful was never even considered by these monarchs. One aspect of the early days of the Revolution that is largely ignored is the portion of this that was a tax revolt. Rioters around the country often focused on burning the deeds and loan paperwork that the nobles had in their houses and businesses, in the hopes that destroying the records would eliminate the debt they owed all together. For this reason, many of the rioters were small business owners instead of the extremely poor, as it is often shown in textbooks.